Valrhona Ivoire is a 35% cacao lightly sweet white chocolate, well balanced with flavor notes of warm milk and vanilla. When coating dark centers, Ivoire is slightly translucent. 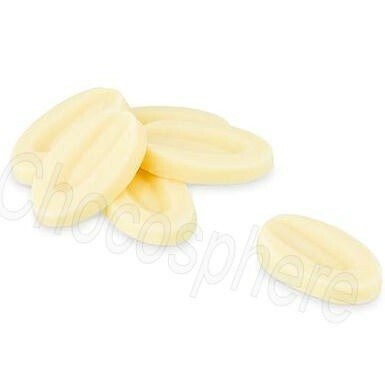 In addition to coating, Ivoire is a good general purpose white chocolate, suitable for pastry, chocolate fillings, moulding, enrobing, icing and more. Choose Valrhona's superb Ivoire, made with real cocoa butter, for your favorite recipes that call for white chocolate! 1 Kg / 2.2 lb bag, Ivoire (White), repackaged by Chocosphere. For a white chocolate that is opaque when coating a dark center, try Valrhona Opalys.